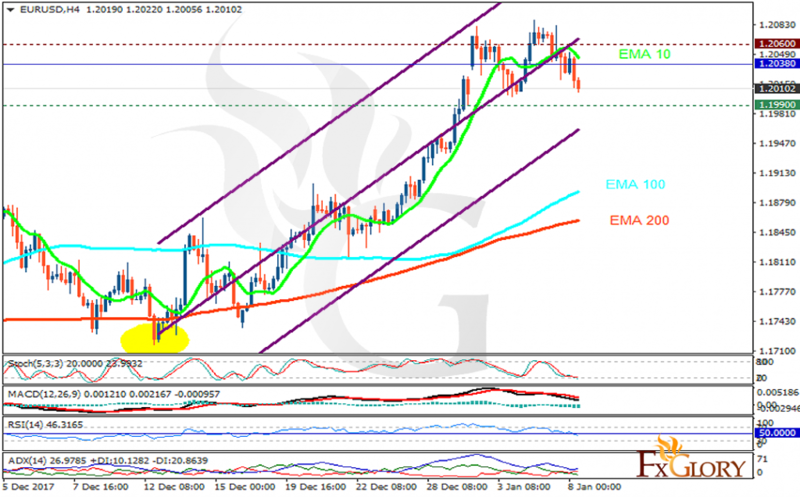 Although last week was the week for the US economic reports, the impact on EURUSD was not significant. EUR is being supported by talks in Germany over Merkel’s seize for power. The support rests at 1.19900 with resistance at 1.20600 which the weekly pivot point at 1.20380 is located in between the lines. The EMA of 10 is moving with bearish bias in the ascendant channel and it is above the EMA of 200 and the EMA of 100. The RSI is falling towards the oversold, the Stochastic is showing downward momentum and the MACD line is below the signal line in the negative territory. The ADX is showing sell signal. The pair is falling down in short term but it is not going to break the support line. Long term traders can go buy and target 1.21.